Lenny Krayzelburg won three gold medals at the 2000 Olympic Games. He has held five swimming World records, setting three of them at the 1999 Pan Pacific Championships. Krayzelburg captured his Olympic gold medals in the 100-Meter Backstroke, 200- Meter Backstroke and 400-Meter Medley Relay. His times in the 100-Meters—53.72—and 200-Meters—1:56.76—set Olympic records. His World records are: 50-Meter Backstroke (24.99), 100-Meter Backstroke (51.28), 200-Meter backstroke (1:55.87)—all set at the 1999 Pan Pacific Championships, 200-Meter Backstroke Short Course (1:52.43), and 400-Meter Medley Relay (3:33.73). Lenny showed considerable swimming promise in his native Odessa, Ukraine, before the Krayzelburg Family moved to West Los Angeles in pursuit of the American dream. Lenny enrolled at L.A.’s Fairfax High School and the Westside Jewish Community Center, where he renewed his swimming development. One of his earliest coaches was Westside JCC Acquits Director Steve Becker, himself a Southern California Jewish Sports Hall of Fame honoree. 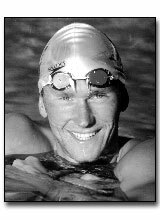 In 1993, he came under the tutelage of Santa Monica Community College swimming coach Stu Blumkin, another SCJSHOF honoree, who introduced Lenny to University of Southern California swim coach Mark Shubert, and the talented backstroke phenom was awarded a full USC athletic scholarship. Winning his first national championships in 1996, Lenny’s breakthrough occurred at the 1997 NCAA Championships when he won the 200-Yard Backstroke event in 1:41.10, the fourth fastest time in history. From that point, he went on to win numerous other titles, including gold medal victories in the various backstroke events at the 1997 Pan Pacific Championships, 1998 World championships and Goodwill Games, 1999 FINA World Cup meets and Pan Pacific Championships, 2000 FINA World Cup meets and Short Course World Championships, and ten major United States swimming crowns en route to this gold medal “threepeat” at the Olympic Games. Lenny plans to defend his gold medal championships at the 2004 Olympic Games.